Launching a new automotive brand in India is no mean feat, and the challenge becomes even more difficult when you plan to exclusively offer electric vehicles. Bangalore-based Ather believes it’s up to the task, and it’s ready to test its faith with the launch of its first creations today. 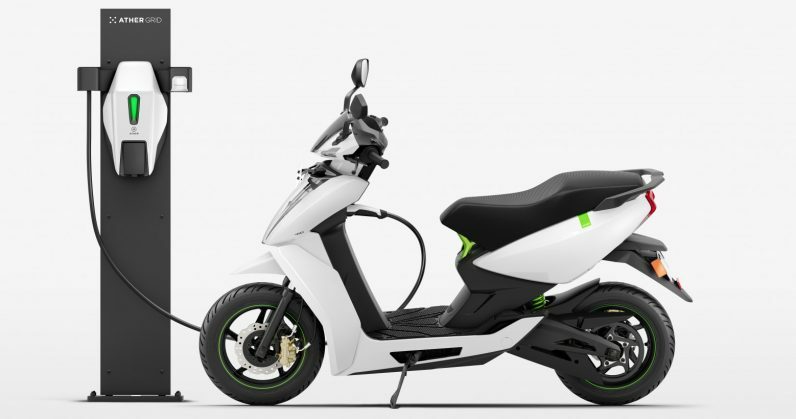 At an event in the city, the company unveiled two electric two-wheelers, the Ather 340 and Ather 450. They promise a range of 60 km and 75 km on a single charge respectively, top speeds of 80 kmph and 70 kmph, and come with a 7-inch touchscreen for navigation. Ather is hardly the first company to bring electric bikes to India – but its approach to bringing its rides to market and curating a thoughtful ownership experience is more akin to that of Tesla than of its local competitors. CEO Tarun Mehta noted on stage that one of the biggest hurdles in launching an electric vehicle brand in India is the lack of charging infrastructure. Charging points are woefully rare in both public and private facilities, and there’s been a chicken-and-egg sort of problem in making them available. Should the government and real estate developers offer points when electric vehicles aren’t yet commonplace, or should they make them available so that people begin buying such vehicles? The company tackled that head-on by launching Ather Grid, a network of smart charging points that offer quick charging and automatic authentication with your vehicle. They’re located at places where people can enjoy some downtime while their Ather bikes charge up to 80 percent in 50 minutes, like coffee shops and malls – and not at places you wouldn’t want to be stuck in, like gas stations. The pilot launch of Ather Grid in Bangalore saw the installation of 17 points across town to ensure that riders are never more than 4 km away from a charging point. It’s an initiative that’s taken two years to come to fruition, and Ather plans to build out grids in every city that it launches its bikes in. Ather also hopes to address all the other pain points involved in owning a bike in India – an effort that likely won’t go unnoticed, seeing as how Bangalore, with its population of 12 million people, is home to 5 million two-wheelers. To that end, it promises to offer comprehensive vehicle diagnostics in its mobile app so you know exactly what’s wrong with your ride, and a system for scheduling vehicle service at your convience – your bike will be picked up for repairs and returned to your address. Those services, along with electricity costs for unlimited charging, consumables, and roadside assistance, are all taken care of with a single subscription plan that’s arguably cheaper than what you’d pay with a petrol-fueled bike. In addition, Ather promises to provide over-the-air updates for firmware and software on its bikes, that could help with things like battery monitoring and power management. Mehta added that most of the hardware is easily upgradeable too – including the battery pack – and that the engineering team already has an eight-quarter plan for adding and improving features on both models. If Ather can deliver on these promises, it will be miles ahead of the competition when it comes to the ownership experience for bikers in India. It’s been working on this effort for some four years in total, with the last two years spent building out not just the charging point network, but also production capabilities. Starting in July, it’ll begin rolling out 250 bikes each week from its manufacturing facility in the city, which can support 600 vehicles a week at its upper limit. The aim is to deliver pre-ordered bikes from August. With that, Ather is set to embark on an interesting journey, during the course of which it hopes to expand to more cities over the next couple of years, and even build other kinds of vehicles. Chief Product Officer Arun Vinayak noted that the team’s collective dream is to build powerful electric bikes, and that the 340 and 450 are stepping stones towards that goal. Chief Business Officer Ravneet Singh Phokela told TNW that the company is constantly learning from its two-thousand-strong community of testers, who have shared feedback on everything from the vehicle’s features to the on-device navigation interface (which only sticks with the basics and doesn’t offer distractions like calls and message notifications from your phone). It’ll be interesting to see how far Ather can take its mission to revolutionize the Indian two-wheeler market. With its current pricing, it’ll likely appeal to tech and electic vehicle enthusiasts initially; reaching a wider audience in the country’s cost-conscious market will take a lot of work to convince potential customers of the value of its service, as well as its lower cost of ownership. The Ather 340 and 450 are available for pre-order to customers in Bangalore from today on the company’s site. They’re priced at Rs. 1,09,750, and Rs. 1,24,750 respectively; the 450 comes with a charging point. The Ather One subscription plan which covers maintenance and other services (including a SIM card built into the bike for navigation) costs Rs. 700 per month.